Should In-App Purchases Be Banned From Children's Games? (Plus How To Disable Them! There have been many stories in the press in the past about parents being landed with huge bills that have been run up unwittingly by their children playing games on phones, tablets and iPads, and it seems that even multi-millionaire celebrities are getting cheesed off with it. I wouldn't normally find myself reading Kanye West's twitter feed, but his tweets on the subject in the picture above do seem to sum up how many parents feel about the issue. My first thought was rather unkindly "well, he can afford it", but then I realised that as odd as it may seem I agree with Mr Kardashian. It's all very well to say "switch off in app purchases" but how many of us know how to do that? I wouldn't have a clue, so I just play it safe and only let the children play on games that don't have any purchases available at all, and that does limit what they can play. Previously apple have been pressured into offering refunds for purchases made in error by children, though whether they will still do this is unclear. I am informed by my technical advisor that it's a bit more complicated disabling the in-app purchases for android devices because there is not one universal solution. Apparently it depends on the device, and then hubby started talking about Jelly Beans, Kit Kats and Lollipop and although I know that refers to software updates I still lost interest at that point. Basically you need to do a quick search online for you individual device and software, or alternatively contact your service provider. It may be a bit more complicated than if you have an apple device, but if it's going to prevent a big bill coming your way it may be worth it. Right, I'd better get on to Kanye with the iPad fix for him. 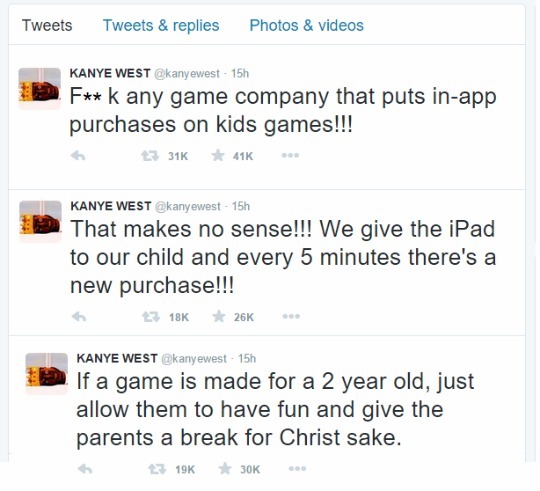 Maybe Kanye should spend some time parenting instead of letting an iPad do it for him.